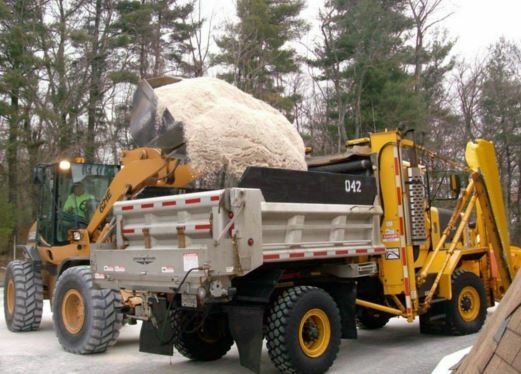 The salt application has proved to be one of the most cost-effective ways of melting snow and ice on roadways. It helps in eliminating accidents on roadways, highways and mainly through bridges. Getting salt on the winter roads is the best way of creating safer travels. Niles Snow Removal is focused on establishing road salt storage buildings. A road salt storage building plan is a way of protecting your investment and adds more efficiencies the moment you need it. The salt and chemicals stored are usually protected and aren’t vulnerable to severe storms and runoff water. Road salt creates a brine between the snow or the ice and the road. Through the brine, it becomes impossible for the snow to stick on the road. It, therefore, becomes really easy to remove snow from the rad. It, therefore, becomes very easy to resume a free flow of traffic on the roads. This will, in turn, reduce the accidents happening because of unclear paths. It also reduces the numerous insurance claims and keeps productions in an economy moving on. Located in Michigan, Niles Snow Removal strives to meet all your snow an ice control need in the most efficient ways. It’s our pride to offer our customers services that always exceed their expectations. We have the right equipment, skills, and experience to handle all your snow removal services.We use the application of salt to roads in the winter season and use it as a de-icing agent. We have road salt storage buildings where we store the salt in and out of season. We are therefore very reliable to serve your urgent needs in whichever capacity. We have the ability to service both the residential as well as the commercial needs. Have actually been extending our services beyond Michigan and have the best in the Snow Removal industry. In some cases, removing the snow is not enough. Through the sand application methodologies, we keep your employees, customers, loved ones and other people in your compound safe. We reduce the ice buildup by ensuring that all your access roads and sidewalks are very safe.It would be easy think of a salt storage barn as simply a building with the impermeable floor. The facility at Niles Snow Removal in Michigan, tells a different story. It is a salt storage family with a great deal of planning. The salt is loaded through a conveyor system which weighs the salt and loads it in the dome simultaneously. The salt is then coated with a special liquid so as to be more effective. The build space is well utilized with specific packages placed in the right position. We have ensured that the doors in the salt building face away for the prevailing wind direction. It is actually strong enough such that not even a storm can interfere with the internal contents. The handling system is therefore made easier during the winter season. Our trucks can, therefore, fill up easily when we have a night of storm and we are therefore able to clear up your roads at a very affordable cost compared to other companies.